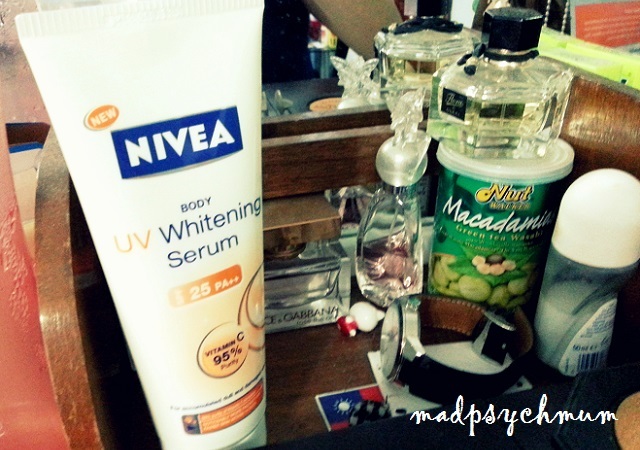 MadPsychMum | Singapore Parenting + Travel Blog: The Most Important Skincare is Sunscreen! The Most Important Skincare is Sunscreen! One of my beauty regimes that I can never do without is suncreen for my face. With the sweltering sun threatening to burn through my skin every time I step out into the sun, this was something I made sure I had on before I left the house every morning. Ironically, although I made every effort to ensure my face is well-protected from the sun, my body doesn't receive the same attention as my face. Although I insist that my girl is slapped on with so much sunscreen on her face and body that she is as white as a ghost whenever we are playing in the sun, for some strange reason I don't do the same for myself.. unless we're at the pool or the beach. But as we all know, sun damage does not only affect your face but also your body as well. I'm one of the many women age 25-40 years old who tend to neglect body UV protection as we are either simply too lazy or don't see the need for it (at least that's true for me!). So I decided to take up NIVEA's 14 Day User Experience Challenge with NIVEA Body UV Whitening Serum with SPF 25, which promises fairer, smoother and more radiant skin in just 14 days! To be honest, I do not have high expectations for this. In the first place, although I do not have extremely good skin (mine tends to be oily and patchy), I also do not have extremely bad skin (i.e. not flaky, rough, cracked or tight). Hence the difference might not be as significant for me as for someone with a worse skin condition, is what I think. Nevertheless, I'm still game to try it out, after hearing good reviews from other mothers. I started applying NIVEA Body UV Whitening Serum before I left the house as is my routine for the application of sunscreen. I must say it absorbed quite well into the skin and did not feel sticky, so much so that I did not even realise that I had applied it after a while. Disclosure: This is Part 1 of a series of sponsored stories on behalf of NIVEA Singapore. All opinions are my own.